Cathleen and I just returned from a week in Bhutan. We traveled among three cities and regions of Bhutan, staying with the Aman hotels. On the next to the last day near the town of Paro, we made the climb to Tiger’s Nest. In many ways it comes very close to what we have imagined for the walk to the clock. If you Google Tiger’s Nest you will get a picture of the end point, the local version of the Clock [of the Long Now]. 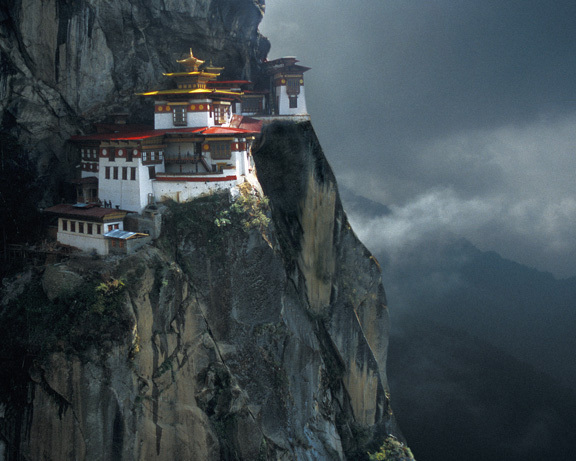 It is a small monastery hung far up on a cliff overlooking a spectacular valley. It is where Padmasambava landed to meditate when he brought Buddhism to Bhutan in the seventh century; He arrived on a flying tiger which had recently been his Tibetan concubine. He meditated in a cave high on the mountain for four months then subdued the local demons and began the conversion of the Bhutanese. Getting there is at least a two hour climb from the valley floor at 7000 feet to the Tiger’s Nest at 10,000 feet. The trail is fine but steep. As you climb ever more vertical switchbacks the monastery appears and disappears in and out of the trees and the mists. Along the way you meet other trekkers some passing you and others coming down. Finally after two hours of a long slow climb to manage the pace of the altitude, one arrives at the beginning of the entrance to the Tiger’s Nest. One is on a promontory of rock across a chasm from the monastery. The cliff drops a couple of thousand feet in front of you and in it are steps carved into its exposed face. No handrails and maximum terror. The fact that a young Bhutanese mother with a small baby wrapped around her came floating up the steps impelled us to the courage needed to navigate the steps back and down into the gorge separating us from the Tiger’s Nest. As we climbed back into the canyon suddenly a one hundred meter high water fall at the deep end of the canyon appeared immediately in front of us with our path traversing directly across it’s base. . Having made it down in front of the water fall the steps started back up toward the Tiger’s Nest once more…over 700 steps in all. After removing one’s shoes one enters the Tiger’s Nest and climbs several levels within, visiting three temples and gasping at the view. High and deep inside is the cold cave where Padmasambabva meditated. You can feel the chill breath coming from the cave. The return journey is much faster, but equally dramatic. Here is a very high res photo.